Besides all the news about Doom Classic, DOS-era gamers were also happy to see a port of Tyian [$1.99] appear in the App Store yesterday. 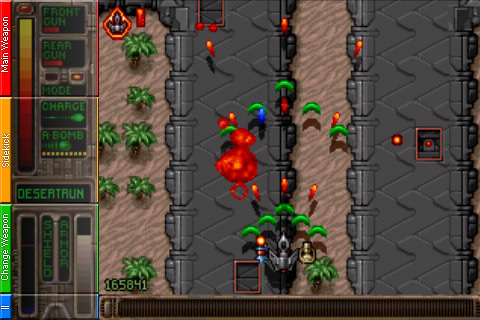 Tyrian was originally a 1995 vertical shoot ’em up that was subsequently released as freeware in 2004. The game is a typical shooter with a significant weapon upgrade system. The iPhone version of the game is based on the open source code project and does not come bundled with the data files due to licensing issues. This means the app will need to download the files (4.6MB) upon first launch so you should make sure you are on a fast and inexpensive connection (Wi-Fi or unlimited cellular) before launching the first time. So for the people that havn’t played it before, the game has “full game" mode and arcade mode. Full game mode allows you to change/upgrade your different weapons and components (front, back, left, right weapons, shiptype and generator). The better weapons cost more, some of them are specific to certain levels, you collect money as you play and upgrade in between levels. Arcade mode has all those weapons but they appear after killing certain enemies and you have to catch them. Upgrades are picked up in the form of common purple orbs that slowly upgrade you over time. So with the menu issues right now you cant upgrade your weapons in full game mode unless there is some trick I’m not seeing. Issue also doesn’t allow the control of sound/music volume. Update: The developer reports that “the weapons upgrade issue is patched, and the new binary resubmitted for appstore review."